That’s more than double the average that someone uses outside of a prison, according to the scientists of the U.S. Geological Survey who says that a person uses about 80-100 gallons of water per day in their home. According to the “Going Green” portion of their site, “[f]or several years, The GEO Group has been tracking and analyzing its facilities’ utility efficiencies on a monthly basis.” But you’ll probably never be able to find out the results of that, because for the past 10 years GEO has also been fighting to beexempt from public records laws that require other government agencies to disclose what they are doing. But the most repulsive portion of GEO’s greenwashing is in their incessant bragging about LEED certifications. 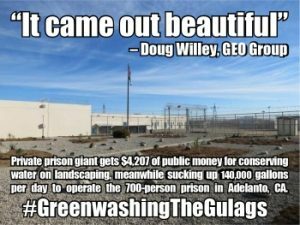 Never mind that private prisons are consistently under-staffed (New Mexico found for-profit facilitiesunderstaffed by 10% or more) by consistently under-paid employees (a report from Texas showed “private prison guards were paid 28% to 37% less than state prison guards”); or that these facilities don’t have to tell you what actually goes on behind their walls; or that they are bastions of corruption. Just take their word for it when GEO says they deserve these LEED certifications. In October 2011, Blackwater River Correctional Facility (BRCI), located in Milton, Florida, became GEO’s first LEED Certified project to receive a Gold Certification… But it didn’t come easy. The story of BRCI reads like a Carl Hiaasen plot. In March 2011, Prison Legal News released an extensive reported on the scandal that led to the construction of BRCI, which was opened at a time when there was excess bed space in Florida’s prison system and it was not needed… Wait, that doesn’t sound very environmental. The deal sparked a federal investigation into the potentially illicit conduct in connection with the legislative process involving BRCI, centering around former Florida House of Representatives Speaker Ray Sansom, who resigned in February 2010 amid a state criminal and ethics investigation. The main thrust of that state investigation involved allegations that Sansom had falsified the 2007-08 state budget to insert $6 million in appropriations for the construction of an aircraft hanger for Jay Odom, a prominent contributor to the Florida Republican Party. GEO Group, incidentally also a major contributor to Florida Republicans, gave $85,000 to the Republican Party of Florida from 2006 through 2009, plus tens of thousands of dollars in donations to state Republican Party PACs and individual Republican candidates. But certainly not all of GEO’s LEED certified prisons could be scandal-ridden, right?! There’s the ever-expanding drought-ridden immigrant death trap, Adelanto Detention Facility, which we discussed earlier, designed to LEED Silver Standard. Then there’s the Broward Transitional Center, next to an animal shelter and across the street from a massive landfill, made famous by hunger strikes and young immigrant activists who infiltrated the facility to reported substandard medical care among detainees. None of the numerous news reportsabout that facility seemed to notice the Silver LEED certification. But if GEO says it, must be so. The Aurora Detention Facility in Colorado is supposedly certified to LEED Silver Standard as well, but the American Friends Service Committee who were protesting the facility’s extended contract and expansion wherein $23 million more taxpayer dollars would go to GEO each year, they didn’t seem to care about the LEED certification either. I mean, you can’t even legally collect rainwater in Colorado. How green could the prison really be?! I also found no mention of GEO’s LEED certification of at Karnes Detention Center, although I did find reports of sexual abuse, extortion and harassment of female detainees. Apparently the quality of the overall environment doesn’t include civil liberties. Come to think of it, the immigrant mothers detained at Karnes Detention Center near San Antonio who told reporters that they faced retaliation after declaring a hunger strike in April to protest the conditions in which their children are being held didn’t mention the LEED certifications either. GEO even indicated that this specific facility was going to be more humane than other immigrant detention facilities. Sarwat Husain, president of the San Antonio chapter of the Council on American-Islamic Relations, wasn’t convinced: “If it walks like a duck, quacks like a duck and smells like a duck, it’s a duck,” she said. “It’s just a glorified prison.” She made no mention of gratitude for the LEED features that undocumented friends or family members may one day wind up forced to witness. And I would add to that, more environmentally-friendly ones. The LEED certification process of the U.S. Green Building Council has been coming under heat for several years in what some environmental groups have called LEEDwashing, a play on the term greenwashing, indicating the short-sighted and narrow tendencies of developers painting themselves as environmentally-friendly to gain public relations points and negotiate permit approvals for controversial projects.